Washington (CNN) - The top Democrat in the House is pushing back against calls to extend open enrollment in the new health care exchanges because of the massive technical problems plaguing HealthCare.gov. "I don't support that," House Minority Leader Nancy Pelosi said Wednesday morning, just hours after Sen. Jeanne Shaheen of New Hampshire appeared to be the first Democrat in Congress to join a growing number of her Republican colleagues in suggesting the deadline be pushed back. The current law stipulates that enrollment in the insurance exchanges set up by the Affordable Care Act ends on March 31, 2014. Those who are uninsured after that point face fines by the Internal Revenue Service. "As website glitches persist, we are losing valuable time to educate and enroll people in insurance plans," Shaheen wrote in a letter to President Barack Obama. "I also fear that people that have tried, and failed, to enroll online may become frustrated and not return to the website to try again at a later date... Allowing extra time for consumers is critically important so they have the opportunity to become familiar with the website, survey their options and enroll." When asked by CNN Senior Congressional Producer Deirdre Walsh, Pelosi said she disagreed with Shaheen, adding that "I think we should fix what we have. Move forward with the deadline we have, respectful of what her (Shaheen's) experience may be, of her suggestion, but not supportive of it." 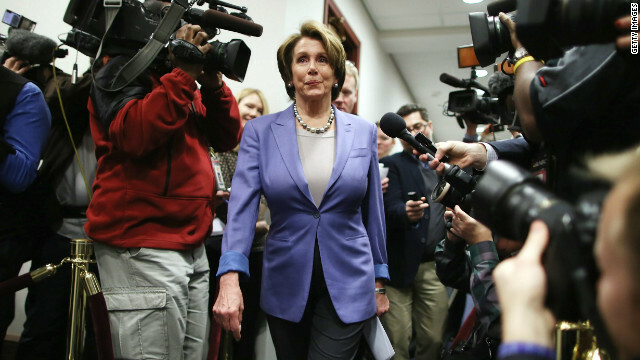 Pelosi also told reporters on Capitol Hill that she didn't hear any members who took part in a closed door meeting of House Democrats and officials implementing the health care exchanges earlier Wednesday suggest that they wanted to push back the deadline. But one senior House Democrat who spoke with CNN following the meeting didn't rule it out. "I'm not prepared to say that now. We're going to have to find out," said longtime Rep. John Dingell of Michigan, a healthcare reform patriarch, when asked about pushing back the enrollment deadline or removing the fine. Shaheen faces re-election next year in a purple state but early polling indicates she's far ahead of her possible GOP challengers. Regardless of her push to extend the deadline, Shaheen does not appear to be a turncoat in the war over Obamacare. The Senator's letter to the President offers high praise of - and some patient frustration with - the law. Democratic Sen. Mark Pryor of Arkansas also supports pushing back the deadline. "The senator has seen the letter and supports the effort to extend the enrollment deadline," Michael Teague, Pryor's communications director, told CNN Wednesday afternoon. Pryor, like Shaheen, is also up for re-election next year. He faces a tough bid for another term in office in a red state and is being challenged by GOP Rep. Tom Cotton. It will be interesting to see the number of people who have successfully enrolled in Obamacare versus the number of people who have has their insurance plans canceled because of Obamacare. "It is somewhat entertaining but mostly irritating to see them doggedly trying to pit their non-factual talking points against the facts presented by you, Data, Rudy and the rest of the team......"
And your posts ALWAYS get on base too, friend. This is what many of us are saying and are baffled over Tampa Tim. Why is the media choosing to ignore one of the most biggest and most inexplicable oxymorons in recent history, that being the Party of the so-called fiscal conservative costing our economy a whopping $24 BILLION DOLLARS as a way to reign in what they refer to as out-of-control unnecessary government spending? Why is THAT not being dissected and seved up to us as breakfast, lunch, appetizer, entree, dessert and after dinner drink as they are doing with the roll out of the ACA? It makes no sense seeing how they are supposed to be the 'librul media' does it? ThinkAgain: Hey, GOP, where's our $24 billion reimbursement check? @just asking: I'm assuming the 9/11 attack you're referring to is the one that Bush was warned about on August 6, 2001? The memo he ignored? Or are you referring to when he and Cheney talked behind closed doors about that day, only on the condition that it would NOT be under oath and could in no way be recorded? – June 14, 2002, U.S. consulate in Karachi, Pakistan; Suicide bomber kills 12 and injures 51. – February 20, 2003, international diplomatic compound in Riyadh, Saudi Arabia; Truck bomb kills 17. – February 28, 2003, U.S. consulate in Karachi, Pakistan; Gunmen on motorcycles killed two consulate guards. – July 30, 2004, U.S. embassy in Taskkent, Uzbekistan; Suicide bomber kills two. – December 6, 2004, U.S. consulate in Jeddah, Saudi Arabia; Militants stormed and occupied perimeter wall. Five killed, 10 wounded. – March 2, 2006, U.S. consulate in Karachi, Pakistan; Suicide car bomber killed four, including a U.S. diplomate directly targeted by the assailants. – September 12, 2006, U.S. embassy in Damascus, Syria; Gunmen attacked embassy with grenades, automatic weapons, and a car bomb (though second truck bomb failed to detonate). One killed and 13 wounded. – January 12, 2007, U.S. embassy in Athens, Greece; A rocket-propelled grenade was fired at the embassy building. No one was injured. – July 9, 2008, U.S. consulate in Istanbul, Turkey; Armed men attacked consulate with pistols and shotguns. Three policemen killed. – March 18, 2008, U.S. embassy in Sana'a, Yemen; Mortar attack misses embassy, hits nearby girls' school instead. – September 17, 2008, U.S. embassy in Sana'a, Yemen; Militants dressed as policemen attacked the embassy with RPGs, rifles, grenades and car bombs. Six Yemeni soldiers and seven civilians were killed. Sixteen more were injured. Regarding dead Americans in general, are you referring to the over 4,400 who died in Iraq, a war we were told you go to "with the army you have," that would not last "6 months," and wouldn't cost us a dime (the Iraqi oil would pay for it)? Or perhaps the Afghan war, which was backburnered when Bush lost interest? But mostly it is pathetic. I have no patience for it. Thank God for you guys. It IS pathetic. I am now into "daily shaking my head" territory. The ticker has become one very long Twilight Zone rerun. To put it a clearly as I can, not only do I find the RW childish infants crying for their binkies, I am totally beyond listening to them; CNN; and the media in general. None of these past few months articles are informative, interesting, or serve any general purpose. Thus, we know who CNN is directing its focus on. I apologize for botching up your post Tampa Tim. I'm at work and I'm rushing before I get busted! Lol! The republikkklans does nothing, knows nothing never enacted any major piece of legislation, do not have an alternative for anything they are against, cannot govern, but their only signature accomplishment is obstruction.